How Will You Challenge Yourself Today? Posted by Oh Yes They Did! Claire Lomas-26.2 Miles, 16 Days, 100% Inspirational! Can’t. My least favorite word. I ban the word both in my classroom and in my life. I prefer “I just haven’t yet!”, because that is the truth! Sometimes a task may seem arduous, but when you put can’t in front of the task, you might as well just say you won’t because that will be the end result! Can’t is a mindset, pure and simple. This morning I heard about Claire Lomas, and her story brought tears to my eyes. Claire was paralyzed from the chest down as a result of a horse riding accident five years ago. Two days ago, she completed the London Marathon in a Bionic Suit, when she crossed the finish line 16 days after the race started. The ReWalk suit, enables people with lower-limb paralysis to stand, walk and climb stairs through motion sensors and an onboard computer system. By shifting her balance, the suit mimics the response her joints would have if they were not paralyzed. She walked 2 miles a day being cheered on by her husband and 13 month old daughter who toddled beside her. Claire will not appear in the official results and did not receive a medal when she finished as competitors have to complete the course on the day of the race to receive one…but that’s alright because what she did receive was much better…There were hundreds of people that showed up at the finish line to cheer her through the tape, and over a dozen runners gave their medals to her in tribute to what she had accomplished. She also raised $111,346.86 for a charity which funds research to develop treatments for paralysis caused by a broken back or neck. When asked about her training she said “There were times when I questioned if I would make it when I was training. Once I started , I just took each day as it came and every step got me a step closer.”. Did you notice that she never said can’t? I did! Claire Lomas is my new hero. She did something truly amazing…because she could! 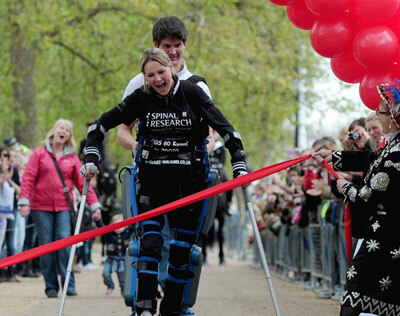 Maybe the next time you feel the need to say that you can’t, you should remember Claire Lomas. So, how will you challenge yourself today? ***PS – There is now a Facebook page called “Claire Lomas. Give Her a Medal”. Please go “like” it. The organizers of the London Marathon really need to reconsider!!! Being “Besties” With Your Child? I'm Not Famous And Neither Are You. ZenFish Dog Drawings – Simply AMAZING!